The lack of empathy in the Millenial has been apparent through the declining voting numbers for in the 2012 and 2016 election, despite their ability to enact major change in the system. Has this sentiment trickled down to Generation Z and has affected student mentality at Leesville? (Photo used by permission of Genetic Literacy Project). 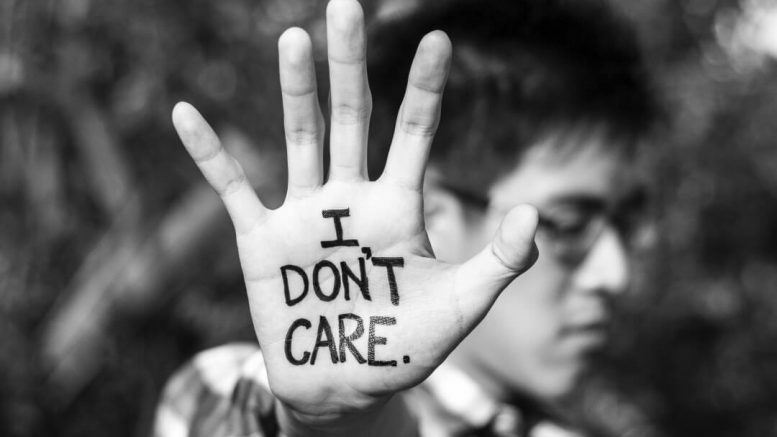 What is Apathy and Why Does It Matter? Apathy is one of the most salient issues in our society today, and almost everyone at one time or another finds themself apt to it. Do you ever find yourself having a lack of interest in hobbies that once thrilled you? Or find it hard to obtain the energy to do tasks? Or maybe you just don’t care as much anymore? 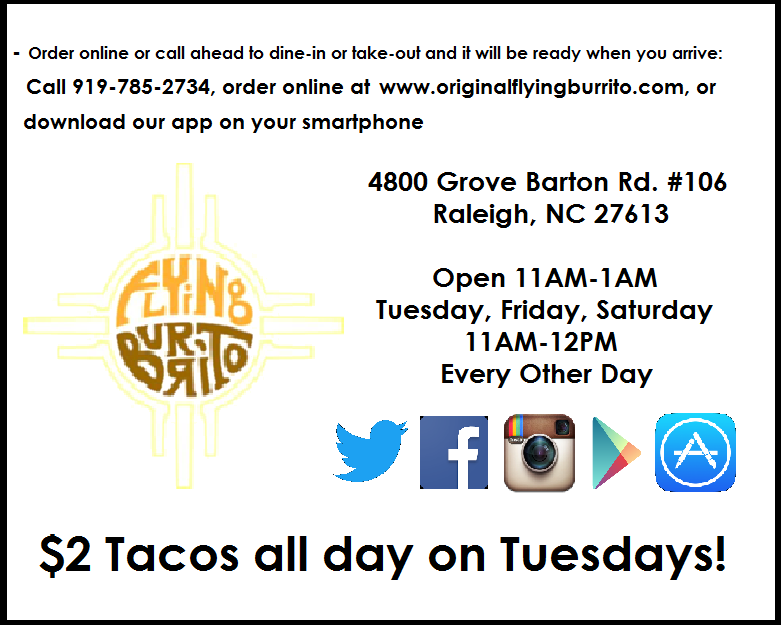 This is a result of apathy permeating everyday life. In order to properly understand the repercussions of the lack of apathy, you must understand the definition of it. Apathy is the lack of interest, enthusiasm or concern in the world around you (Merriam Webster Dictionary). While this is not a permanent condition, it can ebb and wave depending on the day. 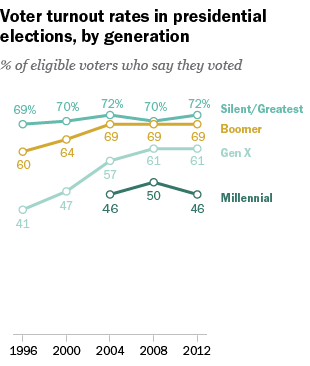 Though millennials make up an increasingly large share of eligible voters, they vote at much lower rates than other generations compared to previous generations. A total of 54 percent of boomers voted in the Nixon-McGovern election, versus 49 percent of millennials in the 2004 Bush-Kerry race (NY Times). (Photo with free use by Pew Research Center). Reports of voter apathy is rampant throughout the news. 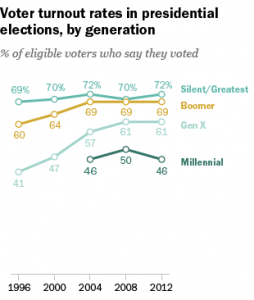 Although all Millennials are eligible to vote now, they are not. This is somewhat due to voter apathy. In the 2012 election, voters between the ages of 18-29 made up just 19 percent of the electorate — that’s half the share of the Baby Boomer voting bloc (who were 38percent of the electorate) (Pew Research Center). 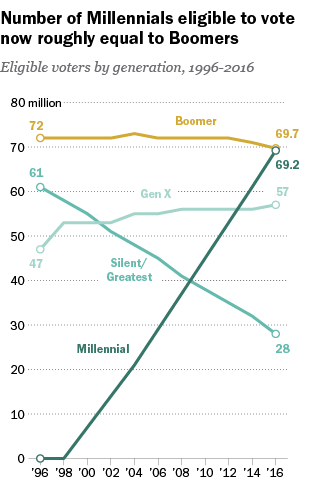 These show the voting trends for millennials, but as Generation Z approaches voting age, how will they vote? There are lots of factors to consider, but apathy is becoming more and more prevalent in schools which will ultimately lead to voter apathy later in life. Most kids are apathetic (or self-absorbed). When kids become adults, they outgrow their apathy. 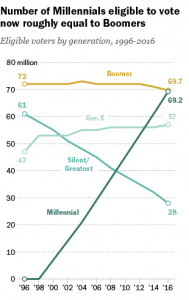 Our generation, however, is showing to not continue this trend to outgrow their apathy. The apathy seen in voting is very relevant in the political climate, but how is student life affected? This lack of empathy in the world around us (more specifically seen at the voting level) also trickles down to the academic level, and even seen at Leesville. 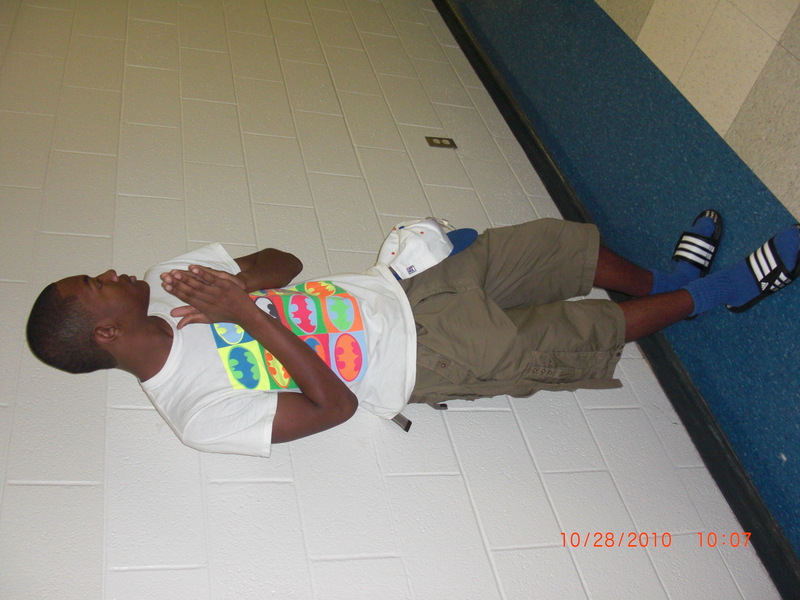 One of the most infamous examples is Senioritis. This phenomena rears its head for every senior, and causes their work ethic to go down the drain. Along with their work ethic, the apathy sinks in, making it more difficult to care about the quality of work in school. Apathy also strikes those who typically have high performance levels. If you ask any AP or Honors student why they take difficult classes, it would rarely be because they truly enjoy the subject. It’s because of the rewards it gives them in regards to college applications and to portray themselves in a better light. Some students are afraid to fail, have troubled home lives, experience peer pressure, have realized that they can get by without working hard, or have one of the other hundred reasons why students don’t try in school. It is crucial, as the student, to make the effort to fight apathy. No one can make a student care, it is solely up to the individual to make it happen. Apathy present in high school students only gets worse, and permeates other areas of life such as voting. It is up to the individual to break the cycle and to care about the happenings around them. Be the first to comment on "Opinion on Apathy"